Phoenicia was an ancient civilization centered in the north of ancient Canaan, with its heartland along the coastal plains of what is now Lebanon. Phoenician civilization was an enterprising maritime trading culture that spread across the Mediterranean during the first millennium B.C.E. Though ancient boundaries of such city-centered cultures fluctuated, the city of Tyre seems to have been the southernmost. Sarepta between Sidon and Tyre, is the most thoroughly excavated city of the Phoenician homeland. Although the people of the region most likely called themselves the kena'ani, the name Phoenicia became common because of the Greeks who called the land Phoiniki - Φοινίκη). This term had been borrowed from Ancient Egyptian Fnkhw "Syrians." Due to phonetic similarity, the Greek word for Phoenician was synonymous with the color purple or crimson, φοῖνιξ (phoînix), through its close association with the famous dye Tyrian purple. The dye was used in ancient textile trade, and highly desired. The Phoenicians became known as the 'Purple People'. The Phoenicians often traded by means of a galley, a man-powered sailing vessel. They were the first civilization to create the bireme. Carthage which rivaled Rome until its defeat was originally a Phoenician colony. They dominated sea trade for at least 3,000 years. They were a conduit through which many ideas were passed on from Asia into Europe, especially into the Greek world. The word 'Bible' is almost certainly derived from Phoenician. 2 The cultural and economic "empire"
4 Did the Phoenicians 'Discover' America? The Phoenician language is counted among the Canaanite languages in the Semitic language family. In addition to their many inscriptions, the Phoenicians, contrary to some reports, wrote many books, which have not survived. Evangelical Preparation by Eusebius of Caesarea quotes extensively from Philo of Byblos and Sanchuniathon. Furthermore, the Phoenician Punic colonies of North Africa continued to be a source of knowledge about the Phoenicians. Saint Augustine knew at least a smattering of Punic and occasionally uses it to explain cognate words found in Hebrew. The name of his mother, Saint Monica, is said to be of Punic origin as well. Many European, North African and Middle Eastern cities can trace themselves back to Phoenician origins. Although overshadowed by the legacy of Greece and of Rome, the Phoenicians opened up trade and commerce and communication on a grand scale, from which all subsequent Empires continued to benefit. The Phonenicians made a substantial contribution to the development of human civilization. According to the Persians best informed in history, the Phoenicians began to quarrel. This people, who had formerly reached the shores of the Erythraean Sea, having migrated to the Mediterranean from an unknown origin and settled in the parts which they now inhabit, began at once, they say, to adventure on long voyages, freighting their vessels with the wares of Egypt and Assyria. In terms of archeology, language, and religion, there is little to set the Phoenicians apart as markedly different from other local cultures of Canaan, because they were Canaanites themselves. However, they are unique in their remarkable seafaring achievements. Indeed, in the Amarna tablets of the fourteenth century B.C.E. they call themselves Kenaani or Kinaani (Canaanites); and even much later in the sixth century B.C.E. Hecataeus writes that Phoenicia was formerly called χνα, a name Philo of Byblos later adopted into his mythology as his eponym for the Phoenicians: "Khna who was afterwards called Phoinix." Egyptian seafaring expeditions had already been made to Byblos to bring back "cedars of Lebanon" as early as the third millennium B.C.E. To many archaeologists therefore, the Phoenicians are simply indistinguishable from the descendants of coastal-dwelling Canaanites, who over the centuries developed a particular seagoing culture and skills. But others believe equally firmly, with Herodotus, that Phoenician culture must have been inspired from an external source. All manner of suggestions have been made: that the Phoenicians were sea-traders from the Land of Punt who co-opted the Canaanite population; or that they were connected with the Minoans, or the Sea Peoples or the Philistines further south; or even that they represent the maritime activities of supposed coastal Israelite tribes like Dan. While the Semitic language of the Phoenicians, and some evidence of invasion at the site of Byblos, suggest origins in the wave of Semitic migration that hit the Fertile Crescent between ca. 2300 and 2100 B.C.E., some scholars, including Sabatino Moscati believe that the Phoenicians' ethnogenesis included prior non-Semitic people of the area, suggesting a mixture between two populations. Both Sumerian and Akkadian armies had reached the Mediterranean in this area from the beginning of recorded history, but very little is known of Phoenicia before it was conquered by Tutmoses III of Egypt around 1500 B.C.E. The Amarna correspondence (ca. 1411-1358 B.C.E.) reveals that Amorites and Hittites were defeating the Phoenician cities that had been vassals to Egypt, especially Rib-Addi of Byblos and Abimelech of Tyre, but between 1350 B.C.E. and 1300 B.C.E. Phoenicia was reconquered by Egypt. Over the next century Ugarit flourished, but was permanently destroyed at the end of it (ca. 1200 B.C.E.). Historian Gerhard Herm asserts that, because the Phoenicians' legendary sailing abilities are not well attested before the invasions of the Sea Peoples around 1200 B.C.E., that these Sea Peoples would have merged with the local population to produce the Phoenicians, who he says gained these abilities rather suddenly at that time. There is also archaeological evidence that the Philistines, often thought of as related to the Sea Peoples, were culturally linked to Mycenaean Greeks, who were also known to be great sailors even in this period. The question of the Phoenicians' origin persists. Professional archaeologists have pursued the origin of the Phoenicians for generations, basing their analyzes on excavated sites, the remains of material culture, contemporary texts set into contemporary contexts, as well as linguistics. In some cases, the debate is characterized by modern cultural agendas. Ultimately, the origins of the Phoenicians are still unclear: where they came from and just when (or if) they arrived, and under what circumstances, are all still energetically disputed. Some Lebanese, Syrians, Maltese, Tunisians, Algerians and a small percentage of Somalis, along with certain other island folk in the Mediterranean, still consider themselves descendants of Phoenicians. The Melungeons are also sometimes claimed to be descendants of the Phoenicians. The cultural and economic "empire"
Phoenician sarcophagus found in Cadiz, Spain; now in Archaeological Museum of Cádiz. 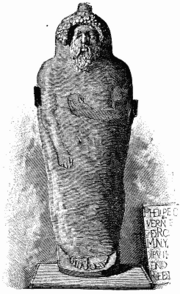 The sarcophagus is thought to have been designed and paid for by a Phoenician merchant, and made in Greece with Egyptian influence. Fernand Braudel remarked in The Perspective of the World that Phoenicia was an early example of a "world-economy" surrounded by empires. The high point of Phoenician culture and seapower is usually placed ca 1200 – 800 B.C.E. 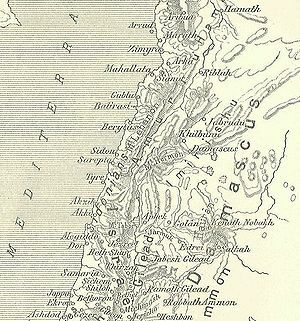 Many of the most important Phoenician settlements had been established long before this: Byblos, Tyre, Sidon, Simyra, Aradus and [Berytus (Beirut) all appear in the Amarna tablets; and indeed, the first appearance in archeology of cultural elements clearly identifiable with the Phoenician zenith is sometimes dated as early as the third millennium B.C.E. This league of independent city-state ports, with others on the islands and along other coasts of the Mediterranean Sea, was ideally suited for trade between the Levant area, rich in natural resources, and the rest of the ancient world. Suddenly, during the early Iron Age, in around 1200 B.C.E. an unknown event occurred, historically associated with the appearance of the Sea Peoples from the north who were perhaps driven south by crop failures and mass starvation following the eruption. The powers that had previously dominated the area, notably the Egyptians and the Hittites, became weakened or destroyed; and in the resulting power vacuum a number of Phoenician cities established themselves as significant maritime powers. Authority seems to have stabilized because it derived from three power-bases: the king; the temple and its priests; and councils of elders. Byblos soon became the predominant center from where they proceeded to dominate the Mediterranean and Erythraean (Red) Sea routes, and it is here that the first inscription in the Phoenician alphabet was found, on the sarcophagus of Ahiram (ca. 1200 B.C.E.). However, by around 1000 B.C.E. Tyre and Sidon had taken its place, and a long hegemony was enjoyed by Tyre beginning with Hiram I (969-936 B.C.E. ), who subjected a rebellion in the colony of Utica. The priest Ittobaal (887-856 B.C.E.) ruled Phoenicia as far north as Beirut, and part of Cyprus. Carthage was founded in 814 B.C.E. under Pygmalion (820-774 B.C.E.). The collection of city-kingdoms constituting Phoenicia came to be characterized by outsiders and the Phoenicians themselves as Sidonia or Tyria, and Phoenicians and Canaanites alike came to be called Zidonians or Tyrians, as one Phoenician conquest came to prominence after another. Map of Phoenicia and trade routes. In the centuries following 1200 B.C.E., the Phoenicians formed the major naval and trading power of the region. Perhaps it was through these merchants that the Hebrew word kena'ani ('Canaanite') came to have the secondary, and apt, meaning of "merchant." The Greek term "Tyrian purple" describes the dye they were especially famous for, and their port town Tyre. The Phoenicians also traded cedar for making ships and other things. Phoenician trade was founded on this violet-purple dye derived from the Murex sea-snail's shell, once profusely available in coastal waters but exploited to local extinction. James B. Pritchard's excavations at Sarepta in Lebanon revealed crushed Murex shells and pottery containers stained with the dye that was being produced at the site. Brilliant textiles were a part of Phoenician wealth. Phoenician glass was another export ware. Phoenicians seem to have first discovered the technique of producing transparent glass. Phoenicians also shipped tall Lebanon cedars to Egypt, a civilization that consumed more wood than it could produce. Indeed, the Amarna tablets suggest that in this manner the Phoenicians paid tribute to Egypt in the fourteenth century B.C.E. They obtained many other materials from distant lands, perhaps the most important being tin and silver from Spain and possibly even from Cornwall in Great Britain, which together with copper (from Cyprus) was used to make bronze. Trade routes from Asia converged on the Phoenician coast as well, enabling the Phoenicians to govern trade between Mesopotamia on the one side, and Egypt and Arabia on the other. 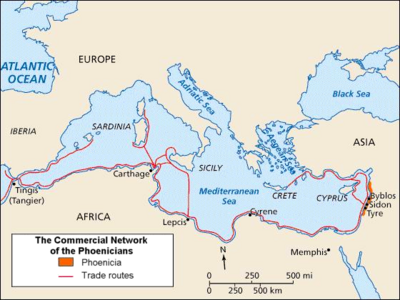 The Phoenicians established commercial outposts throughout the Mediterranean, the most strategically important ones being Carthage in North Africa, and directly across the narrow straits in Sicily—carefully selected with the design of monopolizing the Mediterranean trade beyond that point and keeping their rivals from passing through. Other colonies were planted in Cyprus, Corsica, Sardinia, the Iberian Peninsula, and elsewhere. They also founded innumerable small outposts a day's sail away from each other all along the North African coast on the route to Spain's mineral wealth. The name Spain comes from the Phoenician word I-Shaphan, meaning, thanks to an early double misidentification, 'island of hyraxes'. The date when many of these cities were founded has been very controversial. Greek sources put the foundation of many cities very early. Cadiz in Spain was traditionally founded in 1110 B.C.E., while Utica in Africa was supposedly founded in 1101 B.C.E. However, no archaeological remains have been dated to such a remote era. The traditional dates may reflect the establishment of rudimentary way stations that left little archaeological trace, and only grew into full cities centuries later. Alternatively, the early dates may reflect Greek historians' belief that the legends of Troy (mentioning these cities) were historically reliable. Phoenician ships used to ply the coast of southern Spain and along the coast of present-day Portugal. The fishermen of Nazaré and Aveiro in Portugal are traditionally of Phoenician descent. This can be seen today in the unusual and ancient design of their boats, which have soaring pointed bows and are painted with mystical symbols. It is often mentioned that Phoenicians ventured north into the Atlantic ocean as far as Great Britain, where the tin mines in what is now Cornwall provided them with important materials, although no archaeological evidence supports this belief. They also sailed south along the coast of Africa. A Carthaginian expedition led by Hanno the Navigator explored and colonized the Atlantic coast of Africa as far as the Gulf of Guinea; and according to Herodotus, a Phoenician expedition sent down the Red Sea by Pharaoh Necho II of Egypt (c. 600 B.C.E.) even circumnavigated Africa and returned through the Pillars of Hercules in three years. The Phoenicians were not an agricultural people, because most of the land was not arable; therefore, they focused on commerce and trading instead. They did, however, raise sheep and sold them and their wool. The Phoenicians exerted considerable influence on the other groups around the Mediterranean, notably the Greeks, who later became their main commercial rivals. They appear in Greek mythology. Traditionally, the city of Thebes was founded by a Phoenician prince named Cadmus when he set out to look for his sister Europa, who had been kidnapped by Zeus. The Phoenician alphabet was developed around 1200 B.C.E. from an earlier Semitic prototype that also gave rise to the Ugaritic alphabet. It was used mainly for commercial notes. The Greek alphabet, that forms the basis of all European alphabets, was derived from the Phoenician one. The alphabets of the Middle East and India are also thought to derive, directly or indirectly, from the Phoenician alphabet. Ironically, the Phoenicians themselves are mostly silent on their own history, possibly because they wrote on perishable materials, papyrus or skins. Other than the stone inscriptions, Phoenician writing has largely perished. There are a very few writers such as Sanchuniathon quoted only in later works, and the Phoenicians were described by Sallust and Augustine as having possessed an extensive literature, but of this, only a single work survives, in Latin translation: Mago's Agriculture. What is known of them comes mainly from their neighbors, the Greeks and Hebrews. With the rise of Assyria, the Phoenician cities one by one lost their independence; however the city of Tyre, situated just off the mainland and protected by powerful fleets, proved impossible to take by the Assyrians, and many others after them. The Phoenician cities were later dominated by Babylonia, then Persia. They remained very important, however, and provided these powers with their main source of naval strength. The stacked warships, such as triremes and quinqueremes, were probably Phoenician inventions, though eagerly adopted by the Greeks. Did the Phoenicians 'Discover' America? The possibility that the Phoenician's may have made a pre-Columbian voyage or voyages to the Americas has been explored by several scholars from as early as T. C Johnston's 1892 book, Did the Phoenicians Discover America?. Work on Phoenician coins carried out by Mark McMenamin suggests that gold coins minted in Carthage between 350 and 320 B.C.E. may depict a map of the Americas. Some have speculated that the Phoenicians may even have colonized the Americas. Thor Heyerdahl's Ra I and Ra I expeditions were designed to prove that Egyptian ships could have crossed the Atlantic but could also be applied to the Phoenicians, who were renowned for their seamanship and who were often employed as sailors and explorers by the Egyptians. Some first century peruvian pottery resembles Phoenician pottery. Wreckage of Phoenician ships and an inscription on a rock in Brazil suggests Phoenicians had visited there. Cyrus the Great conquered Phoenicia in 538 B.C.E. Phoenicia was divided into four vassal kingdoms by the Persians: Sidon, Tyre, Arwad, and Byblos, and they prospered, furnishing fleets for the Persian kings. However, Phoenician influence declined after this. It is also reasonable to suppose that much of the Phoenician population migrated to Carthage and other colonies following the Persian conquest, as it is roughly then (under King Hanno) that historical records identify Carthage as a powerful maritime entity. In 350 or 345 B.C.E. a rebellion in Sidon led by Tennes was crushed by Artaxerxes III, and its destruction was described, perhaps too dramatically, by Diodorus Siculus. Alexander the Great took Tyre in 332 B.C.E. following the Siege of Tyre. Alexander was exceptionally harsh to Tyre, executing 2,000 of the leading citizens, but he maintained the king in power. He gained control of the other cities peacefully: the ruler of Aradus submitted; the king of Sidon was overthrown. The rise of Hellenistic Greece gradually ousted the remnants of Phoenicia's former dominance over the Eastern Mediterranean trade routes, and Phoenician culture disappeared entirely in the motherland. However, its North African offspring, Carthage, continued to flourish, mining iron and precious metals from Iberia, and using its considerable naval power and mercenary armies to protect its commercial interests, until it was finally destroyed by Rome in 149 B.C.E. at the end of the Punic Wars. As for the Phoenician homeland, following Alexander it was controlled by a succession of Hellenistic rulers: Laomedon of Mytilene (323 B.C.E. ), Ptolemy I (320 B.C.E. ), Antigonus II (315 B.C.E. ), Demetrius I of Macedon (301 B.C.E. ), and Seleucus I Nicator (296 B.C.E.). Between 286 and 197 B.C.E., Phoenicia (except for Aradus) fell to the Ptolemies of Egypt, who intalled the high priests of Astarte as vassal rulers in Sidon (Eshmunazar I, Tabnit, Eshmunazar II). In 197 B.C.E., Phoenicia along with Syria reverted to the Seleucids, and the region became increasingly Hellenized, although Tyre actually became autonomous in 126 B.C.E., followed by Sidon in 111. Syrian lands, including Phoenicia, were seized by king Tigranes the Great from 82 until 69 B.C.E. when he was defeated by Lucullus, and in 65 B.C.E. Pompey finally incorporated it as part of the Roman province of Syria. From the tenth century B.C.E., their expansive culture established cities and colonies throughout the Mediterranean. Canaanite deities like Baal and Astarte were being worshiped from Cyprus to Sardinia, Malta, Sicily, and most notably at Carthage in modern Tunisia. The Phoenicians are credited with spreading the Phoenician alphabet throughout the Mediterranean world. It was a variant of the Semitic alphabet of the Canaanite area developed centuries earlier in the Sinai region, or in central Egypt. Phoenician traders disseminated this writing system along Aegean trade routes, to coastal Anatolia (Turkey), the Minoan civilization of Crete, Mycenean Greece, and throughout the Mediterranean. Classical Greeks remembered that the alphabet arrived in Greece with the mythical founder of Thebes, Cadmus. This alphabet has been termed an abjad or a script that contains no vowels. A cuneiform abjad originated to the north in Ugarit, a Canaanite city of northern Syria, in the fourteenth century B.C.E. Their language, "Phoenician," is commonly classified as in the the Canaanite subgroup of Northwest Semitic. Its later descendant in North Africa is termed "Punic." The earliest known inscriptions in Phoenician come from Byblos and date back to ca. 1000 B.C.E. Phoenician inscriptions are found in Lebanon, Syria, Israel, Cyprus, and other locations, as late as the early centuries of the Christian Era. Punic, a language that developed from Phoenician in Phoenician colonies around the western Mediterranean beginning in the ninth century B.C.E., slowly supplanted Phoenician there, similar to the way Italian supplanted Latin. Punic Phoenician was still spoken in the fifth century C.E. : St. Augustine, for example, grew up in North Africa and was familiar with the language. The Phoenicians are said to have had a rich literature. Unfortunately, nothing of this has survived. They have been described as "cultural middlemen," often mediating ideas from one culture to others. They have even been credited with sparking off a 'cultural revival in Greece, one which led to the Greeks' Golden Age and hence the birth of Western civilization' itself. In the Old Testament there is no reference to the Greek term Phoenicia; instead, the inhabitants of the coastal are identified by their city of origin, most often as Sidonians (Gen. x. 15; Judges iii. 3; x. 6, xviii. 7; I Kings v. 20, xvi. 31). Early relations between Israelites and the Canaanites were cordial: Hiram of Tyre, a Phoenician by modern assessment, furnished architects, workmen and cedar timbers for the temple of his ally Solomon at Jerusalem. The Phoenician language was largely mutually intelligible with the Hebrew language, and cultural similarities between the two peoples were significant, leading to the worship of Phoenician gods like Baal by some Jews during the time of Prophet Elijah. Of course there is another Hiram (also spelled Huran) associated with the building of the temple. This is the architect of the Temple, Hiram Abiff of Masonic lore. They are vastly famous for their purple dye. Later, reforming prophets railed against the practice of drawing royal wives from among foreigners: Elijah execrated Jezebel, the princess from Tyre who became a consort of King Ahab and introduced the worship of her gods. In the Bible, King Hiram I of Tyre is mentioned as co-operating with Solomon in mounting an expedition on the Red Sea and on building the temple. The Temple of Solomon is considered to be built according to Phoenician design, and its description is considered the best description of what a Phoenician temple looked like. Phoenicians from Syria were also called "Syrophenicians." Long after Phoenician culture had flourished, or Phoenicia had existed as any political entity, Hellenized natives of the region where Canaanites still lived were referred to as "Syro-Phoenician," as in the Gospel of Mark 7:26: "The woman was a Greek, a Syrophoenician by birth…"
The word Bible itself ultimately derives (through Latin and Greek) from Byblos, the Phoenician city. Because of its papyri, Byblos was also the source of the Greek word for book and, hence, of the name of the Bible. ↑ Arniaz-Villena, et al., "HLA genes in Macedonians…." Tissue Antigens, 57(2) (February 2001): 118-120. ↑ Herodotus, The Histories (New York, NY: Oxford University Press, 2008, ISBN 978-0199535668). ↑ Greek and Phoenician Colonies and Trade, Pearson Education. Retrieved May 28, 2013. ↑ Sabatino Moscati, The World of the Phoenicians (Phoenix Giant, 1999, ISBN 978-0753807460). ↑ The Phoenician coin presumed to contain a map of the ancient world. Did the Phoenicians Discover the New World? Retrieved May 9, 2013. ↑ Rick Gore, "Who Were the Phoenicians? National Geographic magazine online. Retrieved November 6, 2007. Aubet, Maria Eugenia, translated by Mary Turton. The Phoenicians and the West: Politics, Colonies and Trade. Cambridge, UK: Cambridge University Press, 2001. ISBN 0521791618 (Bryn Mawr Classical Review, Dec. 17, 2001 review) Retrieved November 6, 2007. Project Gutenberg, The History of Phoenicia. (original 1889) by George Rawlinson. Retrieved May 9, 2013. Rawlinson's nineteenth century text needs updating for modern improvements in historical understanding. Salim George Khalaf Encyclopedia Phoeniciana website (largest and most comprehensive website on Phoenicia about 1,200 pages). University of Pennsylvania Museum offers simplified but unbiased information on Canaan and Phoenicians, emphasizing common aspects of culture among Israel and the other kingdoms in Canaan. Cambridge & Boston Press Phoenician Experience presents recent research on the Phoenicians, and traces their ancient legends. Phoenicians overview by Genry Joil. Did Phoenicians discover the New World? Phoenician research. This page was last modified on 25 March 2019, at 20:17.